Looks like the judge in the Steve Biegel vs. Dentsu suit today denied Dentsu's attempt to dismiss the case. If this sounds like something you've heard before, it kind of is—but not entirely. From what I understand, the earlier ruling by the judge not to dismiss was made pending the delivery of more information about the sexual harrassment to the court by Biegel. As of a hearing today, the judge is saying she's satisfied with the evidence presented and that the case can proceed. Biegel's side didn't comment. Haven't heard back from Dentsu yet but will update when I do. Remember how I said the other day that I wondered what Sir Sorrell was thinking about Publicis' cozying up to Google? Well, none of us have to wonder anymore. Seems Sorrell and Publicis chief Maurice Levy had at it at Davos. Read this Reuters story and you'll see what I mean. Funniest of many funny soundbites, from Sorrell: "Next time I meet with (Google CEO) Eric Schmidt I think we'll send out a press release." Via Adscam. UPDATE: I originally forgot to put the Reuters link. It's there now. Having posted about Sir Martin Sorrell's Davos blog yesterday (no new post up today, tsk, tsk), reminded me that I haven't caught up with the bloggers of DDB recently. When we last visited DDBlogs, our bloggers weren't exactly coming down with carpal tunnel from all their endless ranting. They still aren't, but some actual discussions have broken out about topics like creativity (Bob Scarpelli), communications trends for 2008 (Jeff Swystun), and vodka (Frank Palmer). Still, Scarpelli and Palmer haven't posted since just after Thanksgiving, and the lack of discreet links for any of these posts is a killer if this site has any aspirations to be viral. If you haven't already seen it on TV, here's the 30-second U.S. version of the Sony Bravia "Bunnies" ad from Fallon London. (Well, in the U.S. it advertises a different Sony brand.) As a :30, it's better than most commercials, but this is also a good demonstration of why some commercials are better delivered virally so they can exist in long form. The shorter version lacks the momentum of the minute-and-half-long original, and without the crowd shots of people wondering what the hell is going on while they watch the shoot, there's not so much awe—plus they edited out the massive red bunny. OK, rant over. As you were. Via Bestads.TV. Hill to climb to top of 4As hill ... ha! 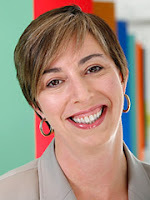 The news that former Lowe and BBDO exec Nancy Hill is in all likelihood going to be the next head of the 4As came out of left field for me. I've never met her, but I guess the 4As has so long epitomized the ad industry's old-boy network that it never even occurred to me that the person replacing Burtch Drake would be a woman. This seems partially a step in the right direction. If I had a personal wish list, however, on what the next chief of the 4As should have on his or her resume, it would be substantial digital street cred, and, far as I know, Hill doesn't have that. Little did we know that, when he's not musing about Google's market cap, Sir Martin Sorrell is a blogger. At least for this week, as he is currently blogging for the Daily Telegraph on his trip to Davos. You can read all about it here. So far, he hasn't said a thing about Google; his main concerns seem to be, in no particular order, the weather, the crowds and the economy. Via AgencySpy. 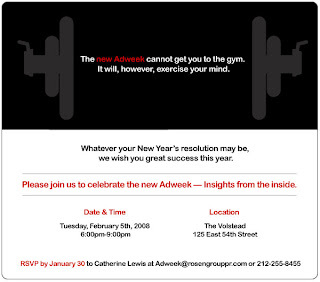 Someone slipped me a copy of the invite to Adweek's relaunch party on Feb. 5, the day after the new Adweek debuts. Don't bother going. You're probably not invited. And neither am I. Just found this rather poignant video on YouTube from our friends at the Dove Self-Esteem Fund in Canada. Someone posted it earlier today. No women in it this time; just a lovelorn male teenager. It's certainly not as, well, in-your-face as "Evolution" or "Onslaught" but is refreshing for its pubescent male take on what's attractive. Assume this is the work of the usual suspects at Ogilvy Toronto. If anyone knows more please write in. Wonder what Martin Sorrell is thinking now that Maurice Levy, David Kenny and other members of Publicis are making nice with Google, actually letting Google engineers into Publicis offices and vice versa in a warm, cozy collaborative relationship. Is he jealous or does he think they're chumps? Hard to say, though his Google obsession is well-known, along with his classification of Google as a "frenemy." Anyway, the Google/Publicis lovefest was foretold by Google ad sales chieftain Tim Armstrong at last month's UBS media conference, where Armstrong said, "If you sat in a room with us when we're meeting with them, I think you would see a very symbiotic relationship. So I think, in essence, the companies that are saying friend or foe, I think they're not as focused on where we see the future going, which is basically see[ing] this digitization where the agencies actually play a very central, hub role." So there! Wow, this new commercial from Monster.com is certainly, well, memorable. And certainly odd. My what big thighs that guy has! According to this story in Adweek, the spot was directed by Rupert Saunders, who also shot the cool, if really fetishistic, Halo 3 "Believe" campaign featuring dioramas of the fictional Halo war. To me it looks a little Terry Gilliam. Via BBDO. Sorry not to post at all on Wednesday, but, hey, sometimes actual paying gigs intrude. OK, so now that I'm scanning the headlines, no real surprise that Adweek waited until Dentsu filed a few more court documents to cover the Steve Biegel vs. Dentsu suit again. Tribal DDB: global agency of the year. Discuss. Maybe, unlike me, you're not someone who knows that it's kind of different for one of the ad trades to name a digital shop its Global Agency of the Year. Not Global Digital Agency of the Year. In other words, by naming Tribal DDB the fairest agency of them all, Ad Age is saying that a digital shop is more worthy of the honor than its traditional brethren (to the extent any of us should be engaging in discussions of traditional vs. digital anymore, but, alas, the chasm still exists). So, whaddya think? Was it time for a digital agency to win the big prize, or an idea before its time? Another discussion point: Adweek named Wieden + Kennedy global agency of the year. Who was more deserving? Tribal or Wieden? Someone better comment now that I've asked all these questions. Here's a promotional video describing the new "Lynx Effect" campaign, titled (wink, wink, nudge, nudge), "Get In There." It's aimed at helping socially awkward young males pick up women. Yes, Lynx is the U.K. name for Axe. If you want to see something cool, leave your misgivings about the politically incorrect nature of Lynx/Axe campaigns at the door and check out the campaign's mobile applications, which start at 1:15 in the video. Via Bartle Bogle Hegarty, London. Wherein I scan the Monday morning headlines on Monday night, because it's a holiday, dammit! 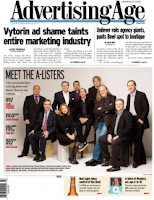 —Ad Age's Agencies of the Year. Agency of the Year (I think this is meant to be U.S.): Goodby; Agency Executive of the Year: Richard Edelman; Global Agency of the Year: Tribal DDB; Multicultural Agency of the Year: Groupo Gallegos; Comeback Agency of the Year: Hill, Holiday; and keep an eye on these guys. Little agencies you haven't been paying attention to get to do Unilever's SunSilk Super Bowl spot. —Aunt Millie in those Vytorin ads (or whatever her name is) gives a black eye to the ad industry. —Watch out! It's Pepsi's Gift Monster! —Bob Garfield tells Sophia to quit advertising SlimFast. —Saatchi promotes two of its top U.S. execs. —The Writers Guild of America plans "to hold informal talks with studio CEOs." —WPP looks to acquire more digital assets. The list of suspects: Spot Runner, JumpTap (who?) and VideoEgg. —London cabbies try to direct customers to gambling site 888.com. —Communications Workers of America use and abuse Washington Post logo. —In one of those instances where Yahoo! should really lose the exclamation point, it plans to lay off workers.